Kimanus Wenda was a 40-year-old farmer and father of three at the time of his arrest. He was born in Honai Lama village near Wamena town in Jayawijaya district. Following an alleged raid on the Jayawijaya District Military Command weapons arsenal on 4 April 2003, Mr Wenda was arrested and charged with treason. After the alleged raid on the weapons arsenal, Mr Wenda was arrested by the military on 10 April 2003. A report by a local NGO coalition states that initially, Mr Wenda, Apotnalogolik Lokobal, Kanius Murib, Yafrai Murib, and Numbungga Telenggen were detained in the Jayawijaya District Military Command for around five days, far exceeding the 24-hour limit for military detention. They were then handed over to the Jayawijaya Police Station on 15 April 2003. A report by the Office for Justice and Peace (Sekratariat untuk Keadilan dan Perdamaian, SKP) states that when Mr Wenda and the other detainees arrived at the police station, the police sent them to the local hospital for a medical check. Doctor Berry Wopari reportedly found that they had all sustained severe wounds and were unwell, with the exception of Kanius Murib. 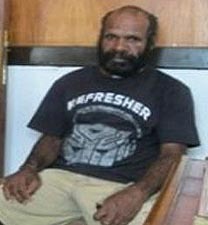 According to a report by the Alliance of Democracy for Papua (Aliansi Demokrasi untuk Papua, ALDP) published in 2011, when Mr Wenda was detained at the District Military Command he was tortured, including being hit on the back and chest with sticks and being pulled about by a rope tied around his neck. He was also tortured when he was later brought to the police station, and to this day his body has reportedly not fully recovered. The report states that Mr Wenda was not accompanied by a legal advisor at any point, and could not read the documents he was presented with. A further report by ALDP (undated) noted many accusations of irregularities in the trial. These included the lack of translators and the prosecution remaining almost silent throughout the trial as their role was being assumed by the judges themselves. The judges reportedly failed to respect the defendants’ rights to be assumed innocent until proven guilty, and pushed the prisoners to accept the state’s version of the story. They also repeated prejudices about the local people of Wamena, such as “people here are lazy and stupid.” According to a 2008 document signed by a government official based in Jayapura, Mr Wenda was found guilty under the charges of treason (article 106 of the Indonesian penal code) and conspiracy (article 110) and was sentenced to 20 years in prison. There have been a number of concerns raised about the treatment of those incarcerated in connection with this case. In 2004 while imprisoned in Wamena prison, Mr Murib and the other people accused of the raid on the weapons store were reportedly “still being intimidated by the intelligence of the Military District Command and Police Mobile Brigade, even when in jail,” according to Ms Anum Sirigar, a member of their legal team. They were also allegedly being denied access to the prison hall, where they were supposed to be able to meet their families or take exercise, because the military were using it for their own purposes. A report by ALDP (2008) describes the forced removal of Mr Wenda from Wamena prison, where he was initially held. On 15 December 2004 he, along with eight other prisoners, was reportedly woken in the middle of the night, beaten until bruised and bleeding and forced to get on a police vehicle. The prisoners were moved to Gunung Sari prison in Makassar on the island of Sulawesi, far from their families. The sudden nature of this move caused fears for their safety at the time. Following the death of fellow prisoner Michael Heselo in Makassar hospital in August 2007, and subsequent protests, the remaining eight prisoners were returned to Papua. Mr Wenda and Linus Hiluka were moved to Nabire prison in Papua, a location which remains difficult to access for friends and family in Wamena. On 25 May 2011, Kimanus Wenda and fellow prisoners Linus Hiluka and Tomi Tabuni were reportedly beaten by four prison guards named Thomas Hamadi, Ferdi Layu, Deni Tandiago and Judi. The beating followed an incident in which the prisoners had reportedly protested against the racist abuse they had received in the prison, and was reported on the website ‘Papuan Journalists’ (Warta Papua Barat). Mr Wenda’s health has deteriorated while in prison and according to reports on Warta Papua Barat he has been consistently denied adequate healthcare by prison authorities. A 2011 report by ALDP states that by August 2011 Mr Wenda urgently needed an operation due to a tumour or growth in his stomach which caused him to vomit continually. Prison authorities have refused to pay for his transport and medical costs, although they are legally obliged to do so. Local NGOs ALDP and Kontras Papua have campaigned for appropriate medical treatment for Mr Wenda, as have international NGOs Amnesty International, Asian Human Rights Commission, and Indonesia Solidarity. In February 2012 local NGOs told TAPOL that Mr Wenda had received permission to leave the prison in order to be treated. However, as at February 2012 the government was still not prepared to pay for transport and medical costs, resulting in campaigns by local NGOs, TAPOL and others to gather funds to pay for treatment. According to a blog by a national journalist, thanks to widespread local and international support, Mr Wenda finally received his operation on 14 March 2012. An article by ALDP states that he was then returned to Nabire prison on 15 May 2012 to continue serving his sentence. In February 2014, Kimanus Wenda and Linus Hiluka received a sentence reduction of two months to their 20-year prison sentences. The Provincial Office of Law and Human Rights informed representatives of Jayapura based NGO, the Alliance for Democracy for Papua (Aliansi Demokrasi untuk Papua, AlDP) that the two men have been placed in a special category allowing them to obtain remission from authorities in Jakarta.